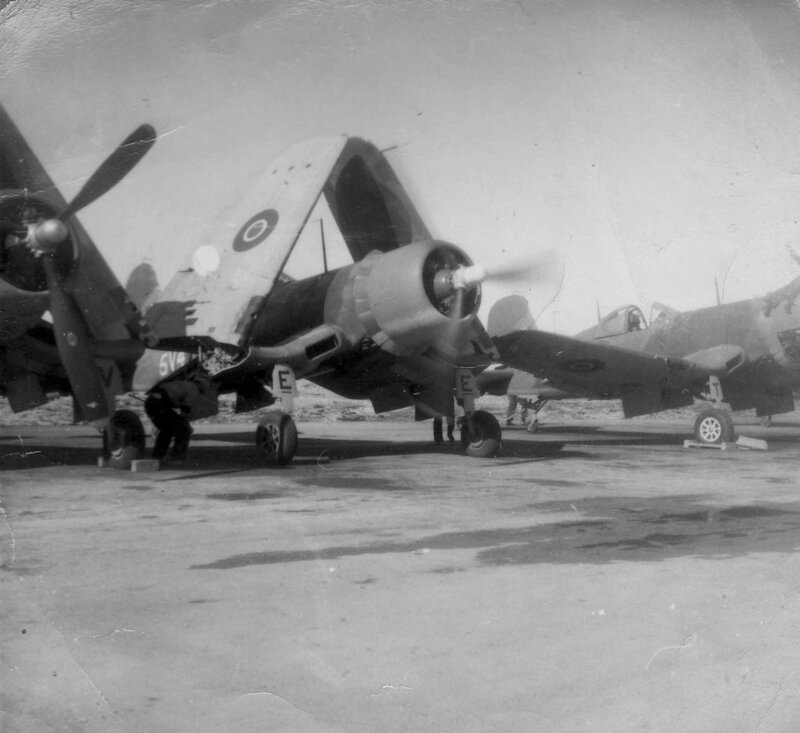 One of the squadron's Corsairs about to taxi out of its parking space for a training flight at USNAS Brunswick. 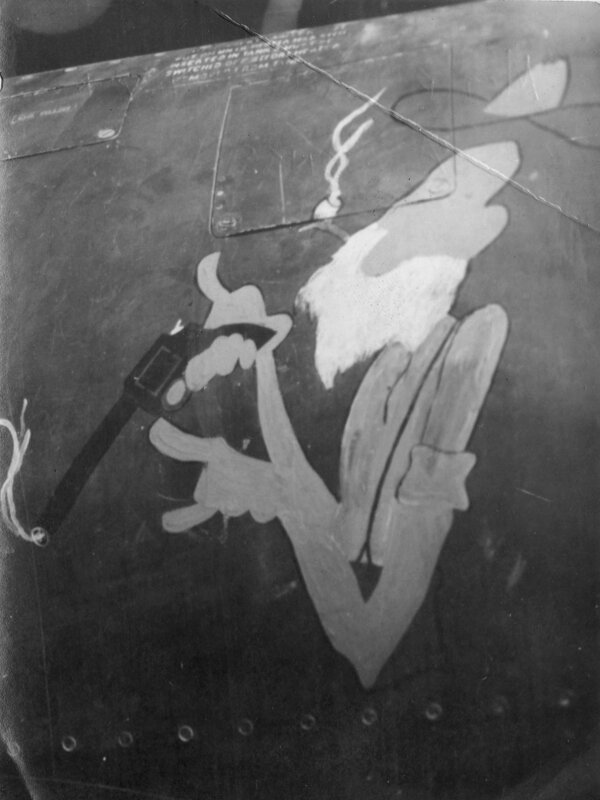 This aircraft carries the side code '5V4' and the letter 'E' on its undercarriage flap. 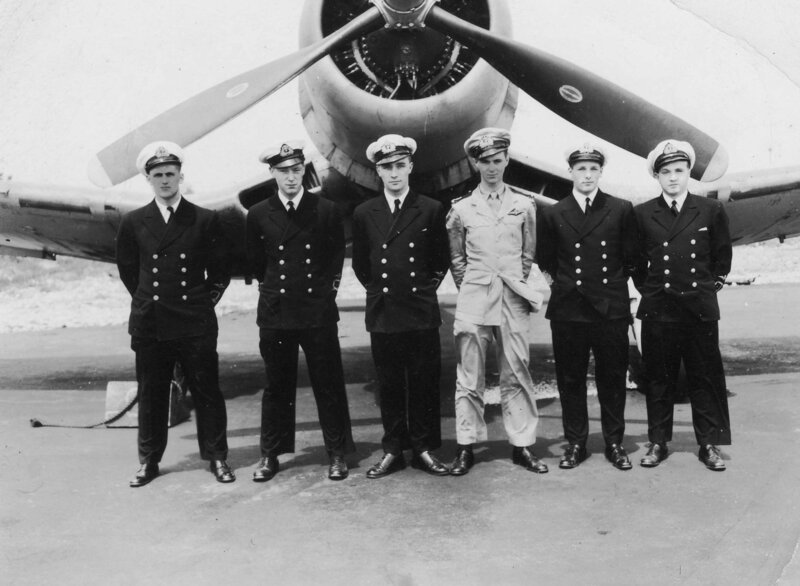 A group of pilots pose with a Corsair after a training flight from USNAS Brunswick. 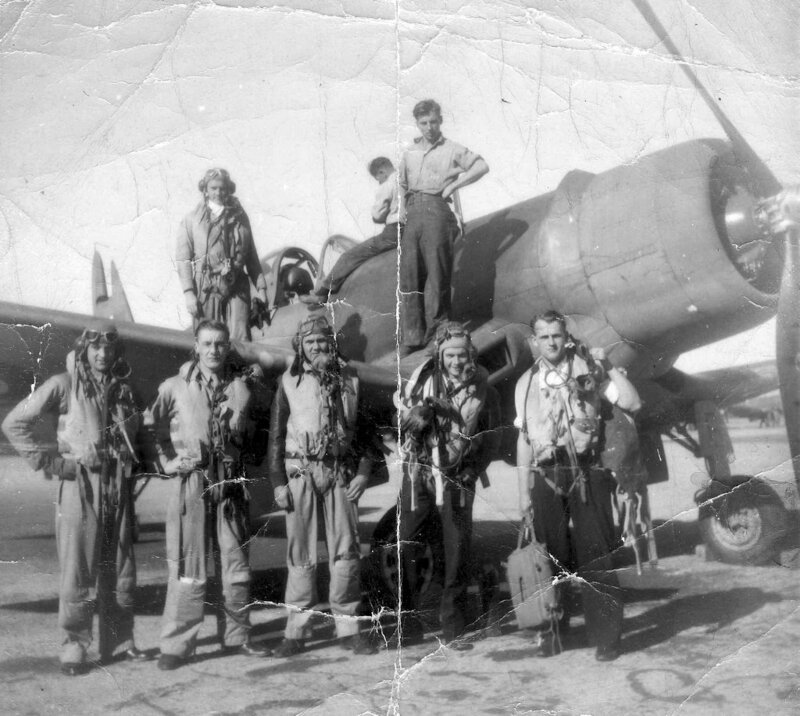 The same six pilots as in the picture above? Aerodrome Dummy Deck Landing practice (ADDLs). 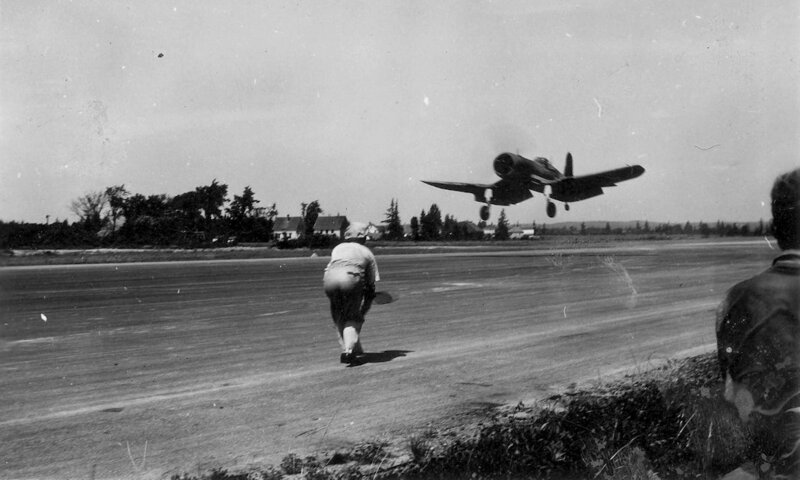 An 1846 squadron Corsair comes in to land having been guided to touch down by the Deck Landing Control Officer (DLCO) or 'Bats' at the edge of the runway while other pilots watch their colleges efforts. 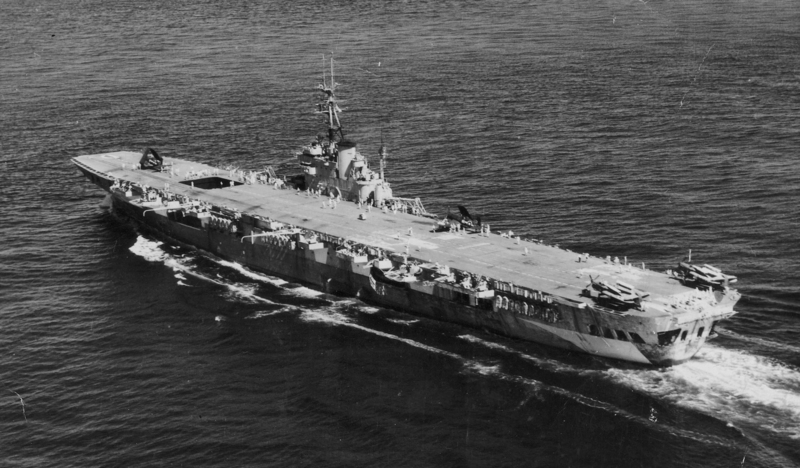 The Light Fleet Carrier H.M.S. COLOSSUS at sea somewhere in the Pacific. 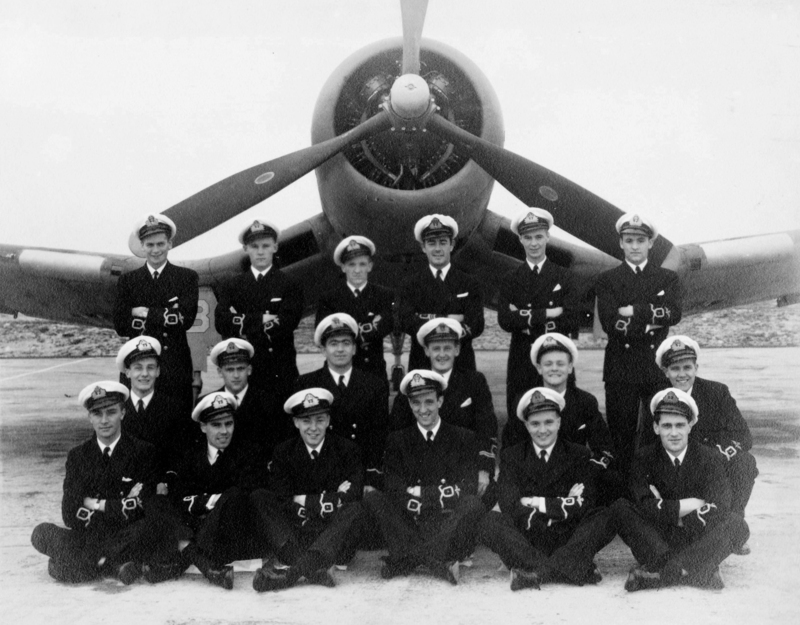 A single Corsair of 1846 is ranged in front of the forward lit and two of 827 squadron's Barracudas are parked at the after end of the flight deck. The flight deck of COLOSSUS with the Corsairs of 1846 preparing to launch on a training flight, probably in the Mediterranean during working-up. 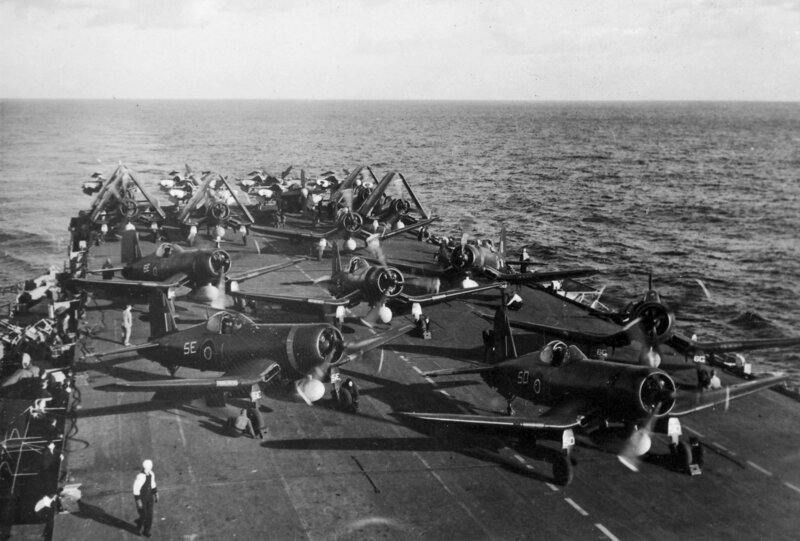 The Corsairs are now wearing the code '5+'. 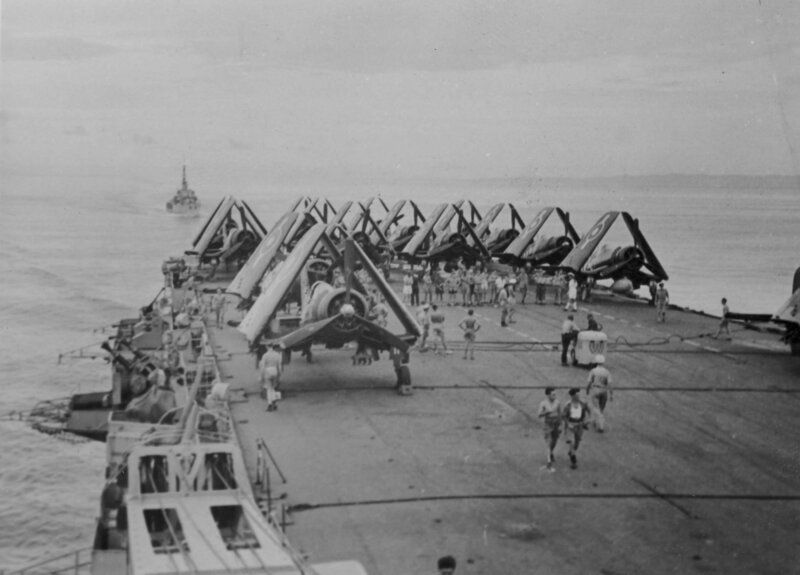 The Barracudas of 827 squadron are ranged, wings folded at the after end of the deck. Somewhere in the Pacific. 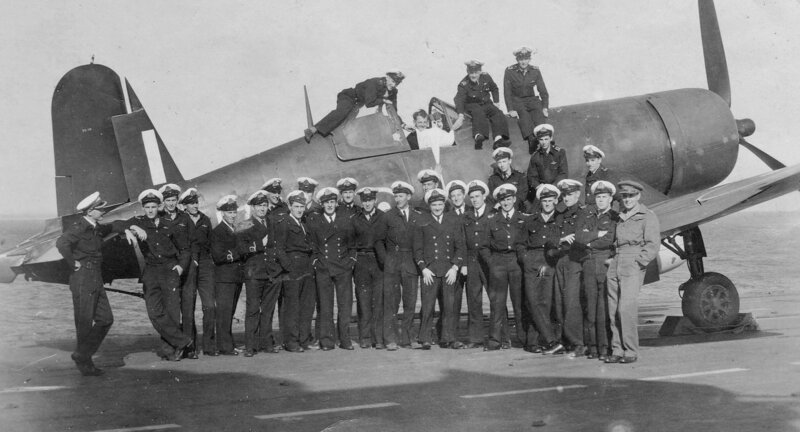 The Corsairs are now wearing the the distinctive British Pacific Fleet roundels on the wings and fuselage as well as a large capital 'D' on their tail fin to denote they belong to COLOSSUS. The side codes have also changed to three numbers in the range 111 - 131. 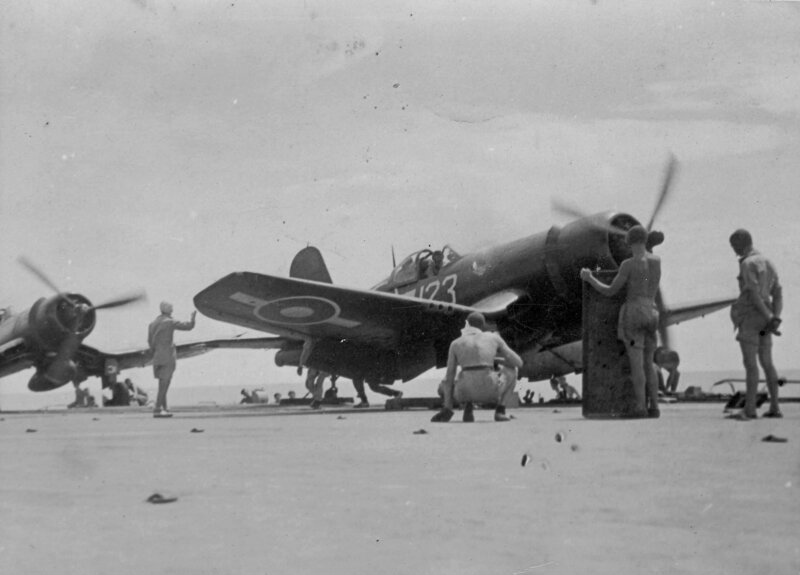 Corsair '123' is readied for an accelerated take-off, the catapult strop is in place and ratings are waiting to remove the wheel chocks. Last minute instructions are padded to the pilot on a blackboard. Corsair '122' making a 'dirty pass' down the side of the ship - wheels, flaps and arrestor hook all down - before beginning a landing approach. Note the large centre line drop tank between the main wheels. A flight of four aircraft in line astern formation. 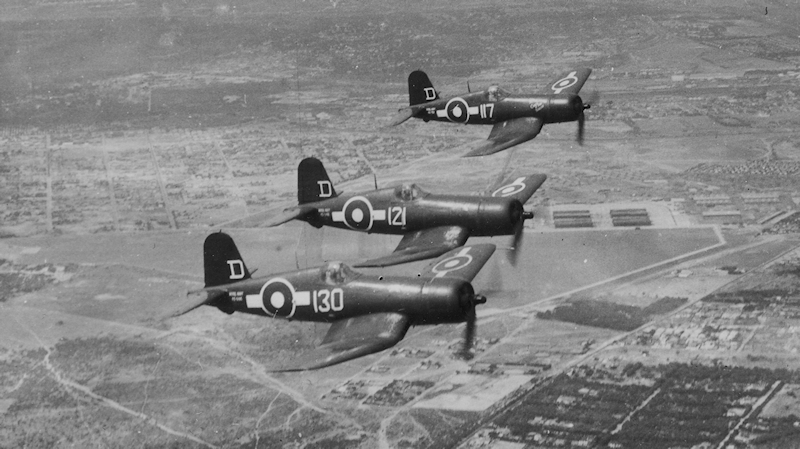 A flight of Corsairs of 1846 Squadron, believed to be over Cape Town, C. February 1946.Sub-Lt A, Jones is in the aircraft furthest from the camera - this machine has the cartoon nose art seen in the next picture. 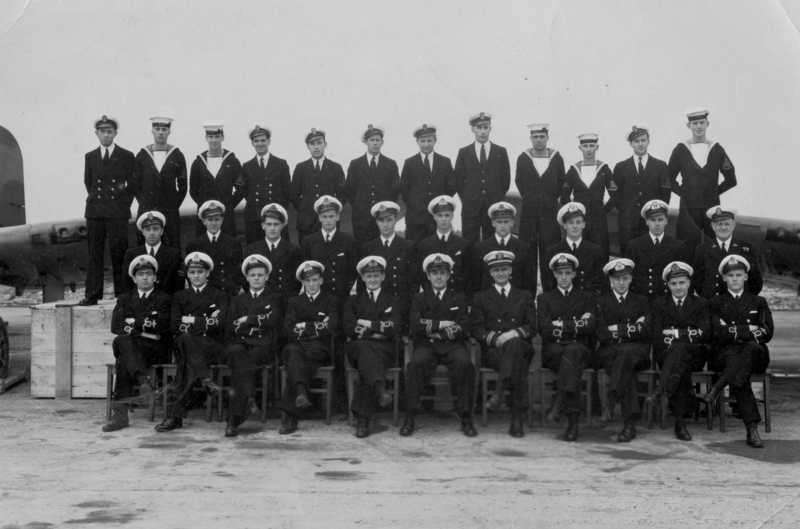 All images courtesy of Mr. Ian Jones, son of Sub-Lt (A) Anthony Jones RNVR who flew with the squadron from its formation to its disbandment. Can you add any photographs? There are not many images available for this gallery, we add any new ones whenever they arrive. Our aim is to record as many as possible for posterity. If you can contribute to this gallery please contact the editor using the feedback form. Thank you.